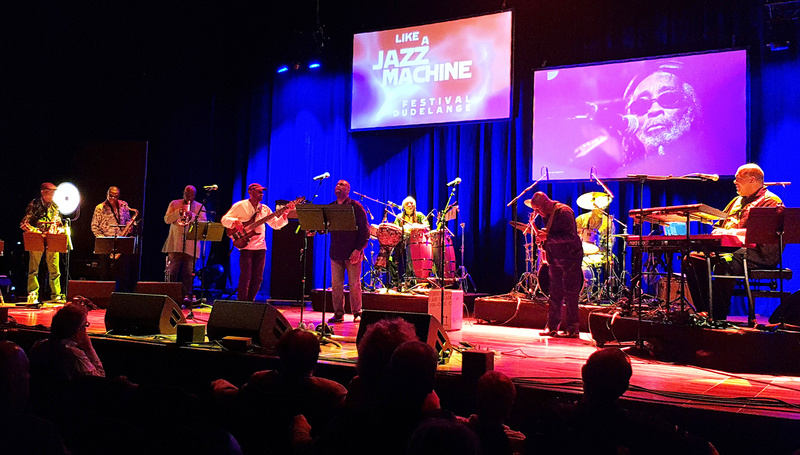 After almost 40 years apart, travelling in different musical directions and varied life paths, Cymande came back together in 2014 in answer to the calls for more. The Core Members comprising most of the original musicians, Patrick Patterson, Steve Scipio, Mike “Bammi” Rose, Pablo Gonsales, Sam Kelly and Derrick Gibbs, the original producer, John Schroeder and engineer, Alan Florence, were reunited and were joined by Adrian Reid, Trevor White and Ray Carless to bring us the essence of Cymande, armed with their individual and shared musical growth and appreciation. The current line up sees a couple of changes. Mike Rose is unavailable at the present time due to other work commitments and Kevin Davy has joined Cymande on trumpet and flugelhorn. The unfortunate withdrawal of Trevor White due to personal circumstances has handed vocal duties over to the very talented Ray Simpson. Rather flatteringly, he writes “It is inevitable then, that while trying to include interesting things that may not be my cup of tea, a couple of acts I ­genuinely love have never received a mention here. This column is an attempt to rectify that”. He starts off with Cymande, and describes us as “brilliant, underrated and …genius”. To read his article Click Here. Cymande’s first review in 40 years was published by Funk U, the 100% Jazz and Soul Magazine. “C’est génial de revenir à Paris au bout de 40 ans. C’est génial aussi d’être encore vivant au bout de 40 ans !”proclaime le guitariste Patrick Patterson en ouverture du concert quasi sold-out de Cymande dans un Trianon rempli jusqu’au sommet de la coupole. Cymande received a lovely little write up about our time in Dublin in MARLBANK, the publication described as the real-time revolution in jazz journalism. Kicking off their first ever appearance in Dublin at the Sugar Club last night the reunited seminal 1970s funk band Cymande who have been wowing audiences in London and Paris did the very same in a vibrant show as they opened their set with ‘Brothers on the Slide’ in front of an up-for-it crowd at the Lower Leeson Street venue. Cymande did a session on Radio 6 Music aired on 30th May 2015 for The Craig Charles Funk And Soul Show where they were interviewed and performed three songs. Here is a taster clip – full session can be heard here. Cymande appeared on the Mark Johnson Show at Totally Radio in September. Following the first tour date in Paris in 2014, Cymande stopped by Mi Soul Radio to discuss the tour, new album and how the band first began all those years ago. We recently appeared on The Robert Elms Show on BBC London 94.9FM. We played an acoustic version of the song ‘No Weeping’ and discussed the new album.